In stock. Order in the next 18 hours, 8 minutes and it will go out today! 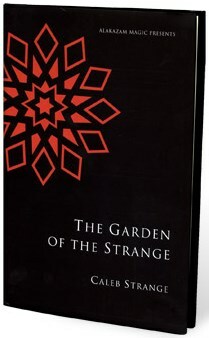 In 2003, Caleb Strange was asked to write a book: nearly four years in the making, The Garden of the Strange is the brilliant result. This beautifully written, deeply affecting book takes Mr. Strange's trademark blend of innovative thinking and stunning presentations to the next level. With twenty compelling and original routines, and an additional half-dozen 'from your pocket' variations, this eagerly awaited work will be of great use and interest to mentalists, bizarrists, and table-hoppers alike. Yet beyond its fine, audience-centered effects, The Garden of the Strange contains something more, of equal value to the working performer. For tucked away within its full and thorough notes, the attentive reader will find explained a wide range of powerful yet often neglected techniques (linguistic, literary, theatrical), which can be used to maximize the impact and enhance the quality of one's work. The Garden of the Strange, then, is a thrilling and, above all, fresh exploration of the art of the impossible: a lyrical and accomplished volume, it has been called, more than once, 'the most inspiring book of magic I have yet read'. Hunting Mammoths in the Rain - An ancient symbol, carved on rock, induces a rich stink of memory in a volunteer. Other members of the audience also share this powerful experience. In Your Hands - A client's question is answered in stunning symbolic fashion during a tarot reading. The Collector - A story about collecting. I'll Take Your Hand, My Love, and We'll Remember - An elderly lady feels young again, and mistily dreams of her first sweetheart. Stepping as Through a Waterfall - A borrowed coin bends and then melts visibly away, as you relate a chilling story. Wishing Star - O Momma! Don't want to tip this one here. But YES! It works. Trust me. Bubbles - A poignant story about bubbles, and what they contain. Safe Hands - A nasty and bloody story about revenge. Junior - A canine-toothed nibble of comic whimsy. A Certain Charm - An embarrassing situation is resolved in a pleasing and most civilized manner. The Koestler Protocol - A spectator mentally selects a target picture, which you are able to duplicate under test conditions. As well as the very clean (I'm told) drawing duplication, there are variations for Remote Viewers, Bizarrists, and elfin Enchantresses. Synchronicity - A spectator shares a dream and something wonderful happens. A profound, meaningful coincidence - synchronicity. Sinne Eater - An atmospheric 'period' story about eating. Bonus inclusion: Caleb's recipe for plum cake. We Eat What We Are - In a communal act of courage, you and your guests resolve long-troubling memories. Hidden Treasure - Magic sparkles delightfully in an unexpected place. The Wrong Side of the Road - A story with a thought-provoking twist. The Ten Thousand Things - A member of your audience - a stranger to you - duplicates another's drawing on stage. Play the Film Backwards - A life in pictures.